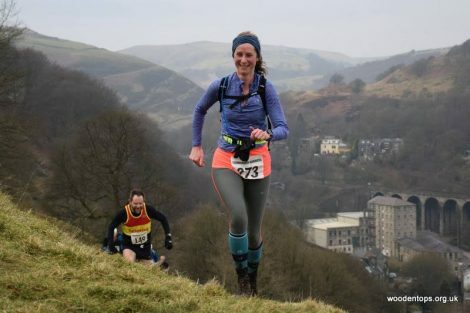 Laura Gale Reports: The Flower Scar Fell Race in Todmorden – not far from Manchester and next to Hebden Bridge – was another little notch on my fell running bedpost, and a real gem of an event. 8.5 miles and 2165ft of climbing. HQ was at Todmorden Cricket Club and it was £5 entries on the day. The course, across the South Pennines of West Yorkshire, was partially marked (PM) with local knowledge (LK) an advantage. Strict FRA rules applied and *every* runner was kit checked prior to being given their numbers. The race started across a park and then immediately up a very steep bank on a muddy path. Lungs and limbs (LL) were struggling from the get-go. The first 3ish miles were all up hill – past galloping horses and mist-shrouded wind turbines on Flower Scar Hill. Turbines sure do help navigation across a bleak moor. The downhills were really rewarding on this fell race with bouncy, tufty (ankle busting) grass and super splashy muddy tracks. The landscape was stunning and the route took us up numerous windy steep-sided river valleys, over high points and through silent misty fir tree plantations. Runner camaraderie (RC) was in full flow, as the occasional stile meant that we were temporarily bunched up (TBU). Marshals and runners referred to me as “lass”. I was making good steady progress, but my pace is always quickened if I spot a ponytail (PT) or similar ahead of me. Adam blinked and I had sped off in pursuit. I overtook 2 women towards the end of the race and had a really strong finish (SF). Hosepipe round the back of the club house, 80 pairs of trail running shoes round the front, beef stew and a hunk of bread (BSAAHOB), and a table groaning with prizes inside. I’m repeatedly inspired by the strength and speed of older runners at Fell races. V70 category prizes at this one! This entry was posted in Fell, Race Reports by BvH Admin. Bookmark the permalink. Brilliant report, Laura – really want to run it. I have no problem with PM and LK – it is the ones that say NS that worry me in areas where I don’t have LK. Well done to both of you. A splendid Race Report Laura. Congratulations to you and Adam for successfully completing the Flower Scar Fell Race.